This great article was published almost a year ago but is well worth reading. At the IDFA (International Documentary Film festival Amsterdam) last week I happened to see a work-in-progress preview of a ‘Requiem for Detroit’ by ‘roll&roll’ documentary maker Julian Temple. It included some of our friends – Grace Lee Boggs, poet John Sinclair, the Packard plant and artist Tyree Gruyton. On the whole there were way too many white men talking and not enough coherent Afro-Americans included, but it linked threads of auto-industry and Motown and was, I suppose, entertaining enough. It’s a BBC-2 production, I expect it’ll be out sometime early next year. “An award-winning independent production company has been commissioned by BBC Two to produce a documentary that will tell the 'roller-coaster' story of a US city's automotive industry. Yesterday, November 15, Stuart Elliott wrote for the NY Times about selling Detroit as a creative Haven. Check it out. 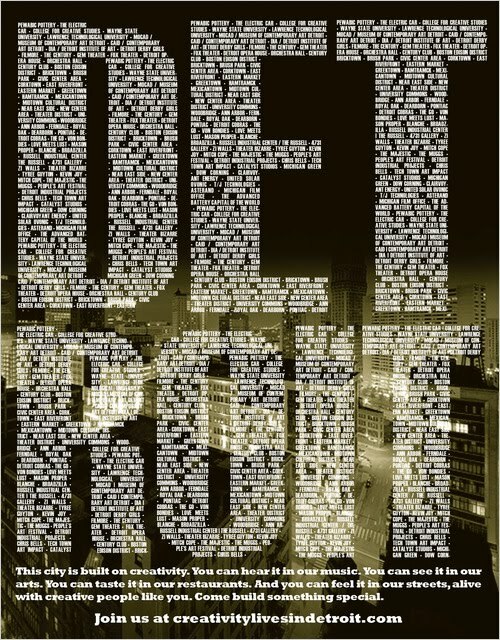 Model D, a web magazine that creates a new narrative for Detroit, covered Diederick Kraaijveld’s project. “Artist Diederick Kraaijeveld is standing over what looks to be a pile of junked wood. The pieces are assorted in color, jagged and broken, and the rusty, crooked nails jutting from the ends of a few slabs seem like prime territory for acquiring tetanus. "I know where each one of these came from," he says as he plunges his hand into the pile and grabbing a yellow, short, stumpy, square plank. "This came from the Packard Plant. The color has a lot of texture and history to it." Sure, but watch those nails, please. press from NEW GEOGRAPHY via a mention in the NYT. 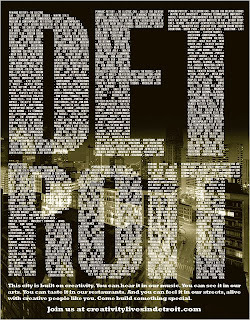 Long article in today's Guardian about Detroit click here for the link.